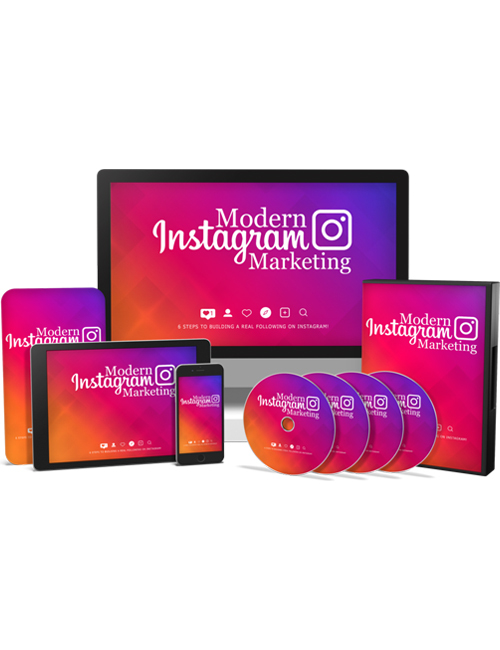 Modern Instagram Marketing – 6 Steps To Building A Real Following On Instagram is an extensive and powerful video course that shows you the massive traffic opportunity available to you if you’re running a business. The largest social media platforms including Facebook and Twitter are used by hundreds of millions of people on a daily basis. Instagram likewise is right up there and growing bigger by the day. If you’re in the business of selling then you absolutely and most definitely need to consider Instagram as part of your strategy. For many new marketers starting out, they don’t fully understand the power of Instagram and how to utilize it for their business. In this course, you are going to learn exactly what Instagram can do for you. If you think it’s just a social media platform where people post up their daily photos then you’d be very wrong. It’s far more than that when you consider the reach, the brand opportunity, and the traffic available. You’ll learn what Instagram marketing is all about, why marketers fail with it initially, the power of influence marketing, how to promote yourself and build your brand, how to dominate your niche, how to identify your competitors and use them to enhance your business, how to create a proper content strategy and sales funnel, how to use Facebook’s Ad Retargeting system to gain a bigger Instagram following, how to optimize your funnel and so much more. This is all about building your brand and following, and boosting your results relatively quickly with authority. You can also get the Modern Instagram Marketing Ebook with this course. If you’re ready to ignite your brand and your business, grab this course now.